Folder Guard allows you to designate specific users as the "trusted" ones. For example, if your computer is set up so that other users have their own login names and passwords, different from yours, then you probably want Folder Guard to apply its protection only to other users and not to your own user account. Another case is the system user accounts which are used by Windows services in the backgound: you probably want them to have an unrestricted access to the computer, in order to perform the system tasks smoothly. 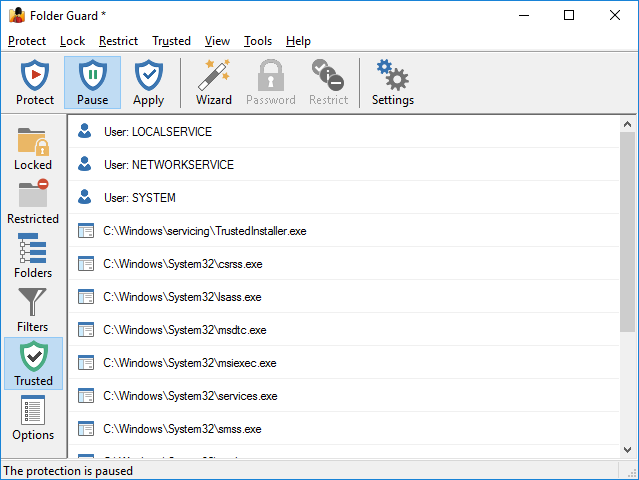 Originally, the Trusted list contains several system accounts that must have full access to all files and folders on your computer in order for Windows to operate properly. When performing the protection, Folder Guard intercepts the requests from programs to open files, list the contents of folders, etc. If such a request comes from a user that is designated by you as a trusted one, Folder Guard passes the request on to the operating system without any intervention, thus allowing the user to have a full access to all folders on your computer. If the name of the user is not in the Trusted list, Folder Guard allows or denies such request according to the restrictions of the files and folders that you've set up. In other words, the Trusted list overrides other restrictions you might have set up with Folder Guard. For example, you could configure Folder Guard to hide a specific folder for a specific user, but if you add that user to the Trusted list, the folder will not be hidden for that user. If you want to fine-tune the restrictions for a specific user, remove it's name from the Trusted list first.